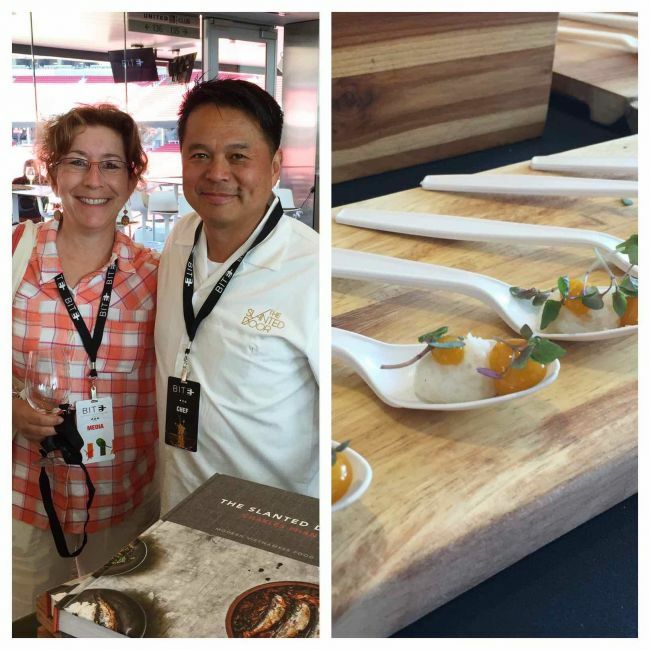 My birthday and an inaugural world-class food event in the same week! What more can a food blogger ask for? 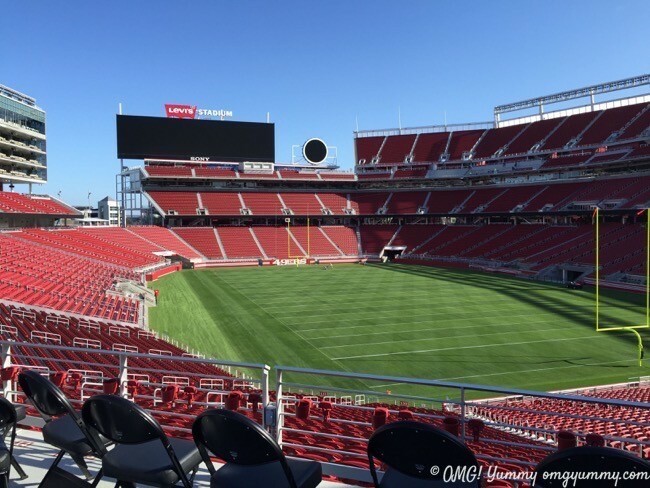 BITE Silicon Valley took place at the impressive if not imposing new home of the San Francisco 49ers, Levi’s Stadium. 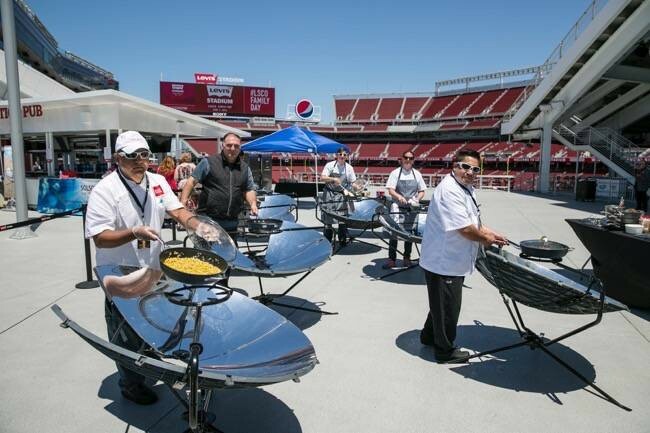 The stadium’s Santa Clara location and modern, comfortable event spaces offered the perfect home for a show focussed on the intersection of food and technology. 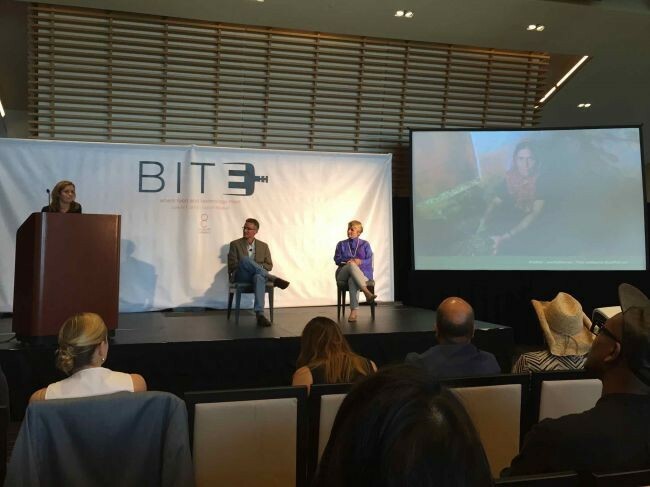 Friday June 5 was a day of learning with sessions on global issues including food security, food waste and GMOs, while Day two and three were Grand tasting events with a bit of technology and demo sessions interspersed amid the food bites and wine sips. 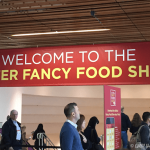 Thanks to a last minute press pass, I attended the Friday conference as well as Sunday’s Grand Tasting. Friday began with a keynote address from the Chef Chair of the conference José Andrés, who discussed the need to find sustainable ways to feed an increasing population. 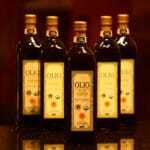 “Food is the most important energy. It moves everybody,” Andrés said. “Food should be a positive agent of change.” His contribution to this vision was an impressive demo on the weekend of solar clean cook stoves used exclusively to prepare three vegetarian tacos – the sweet corn taco with Mexican crema was my favorite for flavor and texture especially the pulverized dried corn nuts on top. Friday’s first panel “What Are You Doing to Enable the Planet to Feed 9 Billion People?”moderated by Dorothy Cann Hamilton, CEO of the International Culinary Center, included Michiel Bakker, Director of the Global Food Program at Google who showed us how a large company can initiate small steps for big impact in controlling food waste and providing healthier food for their employees. 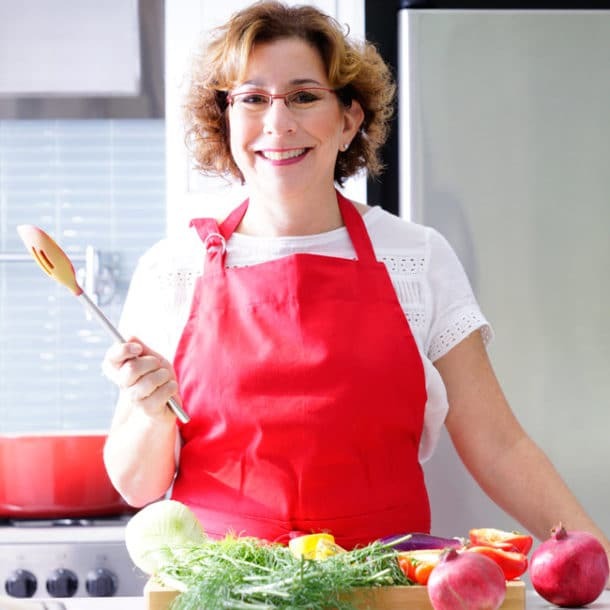 Danielle Nierenberg, President of Food Tank believes agriculture is the key to feeding the world and shared the “down in the trenches” perspective from farmers around the globe who are contributing to food security in inventive ways. The next panel focussed specifically on food waste with DC Central Kitchen and L.A. 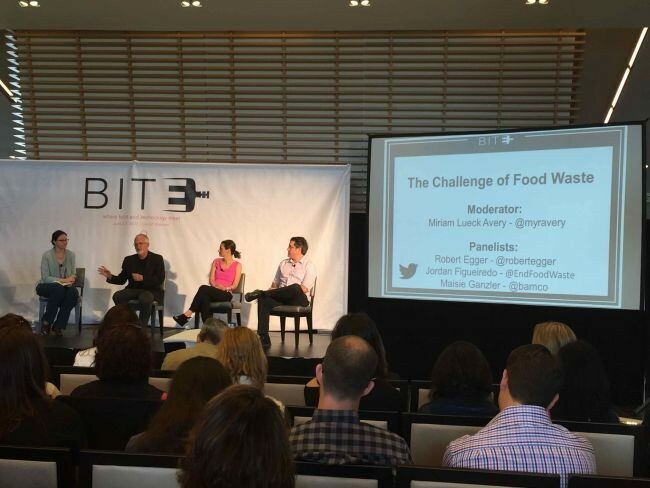 Kitchen Founder Robert Egger, Maisie Ganzler from Bon Appetit Management, and Jordan Figueiredo from EndFoodWaste.org — a social media campaign around the important idea that ugly fruit and vegetables are just as delicious as the beautiful ones. 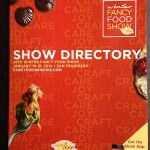 I was first introduced to this idea at the PMA Fresh Summit show in October. In Europe the campaign is called Inglorious Fruits and Vegetables. It is estimated that as much as 20 – 40% of produce is wasted because of it’s less than perfect appearance. 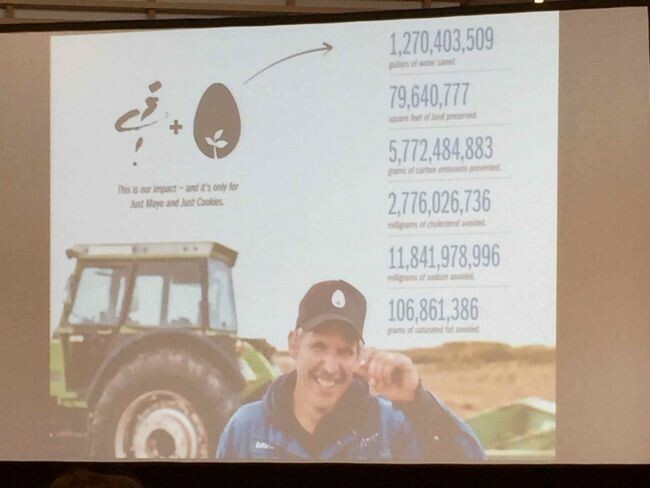 Josh Tetrick, CEO of Hampton Creek shared his compelling story of his quest to see: “What would it look like if we started over?” Why does bad food taste good and good food taste bad? Does it have to be that way? 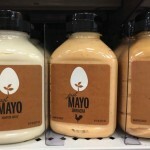 Hampton Creek uses new plant based ingredients, such as pea protein, to create an eggless mayonnaise with the pleasing taste and texture of its egg-based relative. Translated to cookie dough, this technique means you can eat uncooked dough with no worries about raw egg safety issues! Who doesn’t like cookie dough? Thanks Josh! 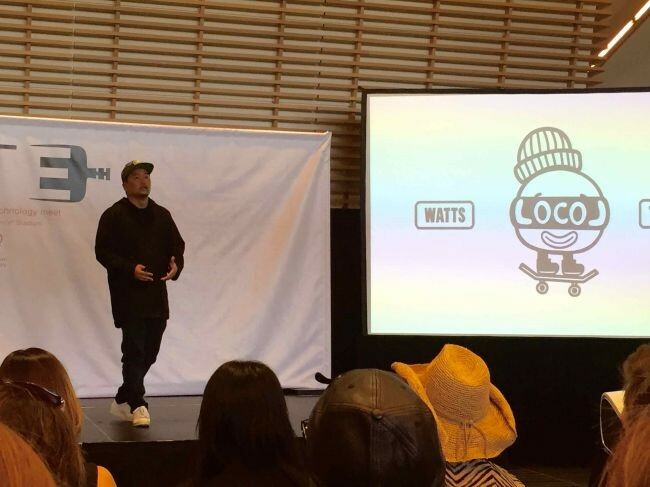 Chef Roy Choi discussed his quest to bring wholesome, accessible and affordable food via his Loco’l project to food deserts such as Watts in Los Angeles and The Tenderloin in San Francisco. His story is compelling and his passion draws you in quickly, but the challenges of turning his dream into a profitable business will be many. I, for one, hope it succeeds and the concept can make it to suburban neighborhoods that are currently overrun with fast and unhealthy food. The last and most anticipated session was unfortunately the most disappointing. It was advertised as a debate but came across more like a very friendly conversation. 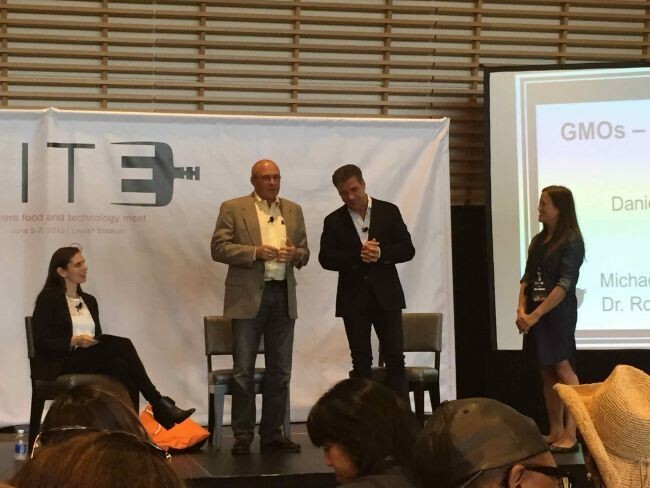 Chef Chiarello is endearing to say the least and Monsanto Chief Technology Officer Dr. Robert “Robb” Fraley is well-spoken but the audience was hoping for friendly boxing gloves not a cordial handshake. Near the end, Chef Andres finally asked the question that moderator Danielle Gould had not yet raised: Why not support labeling so consumers can decide? Monsanto said they support it at a national level, trying to justify their successful funding of an anti-labeling campaign in California. 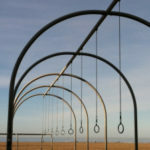 This discussion never veered into uncomfortable territory, leaving us all hungry for more thought-provoking conversation around a contentious issue. In contrast to the seriousness of the discussions Friday, Saturday and Sunday overflowed with wine, beer, scotch, coffee, and a myriad of marvelous munches. Here are a few of my favorites from Sunday. Smoking unexpected foods such as brown sugar and olive oil, and in this case goat cheese seems like a culinary technique in vogue. 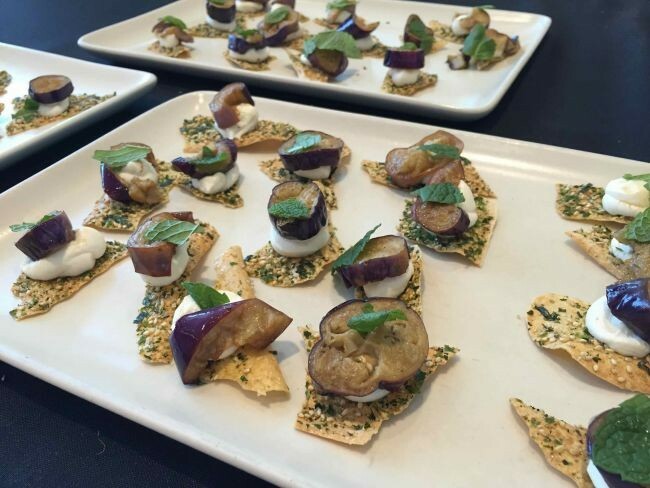 Charlie Parker’s Haven in Jack London Square offered this furikake cracker topped with smoked goat cheese, sweet and sour eggplant, and mint – a little Asian influence fused with Middle Eastern flavors. 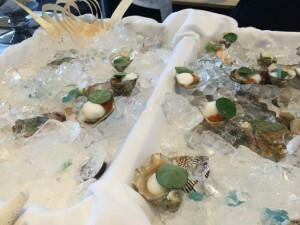 These oysters on the half shell by Chef Yu Min Lin of The Sea by Alexander’s Steakhouse were sublime topped with tobasco and lemon. 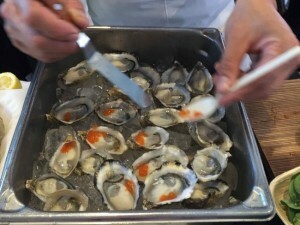 Not a fan of raw oysters? This tiny succulent bite would change your mind. The wine tastings ranged from obscure to traditional and seemed worthy of the $149 price tag that many paid for entry for the day. Dormant Chef and I enjoyed an unlabeled small batch pinot from Alquimista Cellars on the Sonoma Coast but also a chance to try an old favorite BV’s George de La Tour Private Reserve Cabernet. 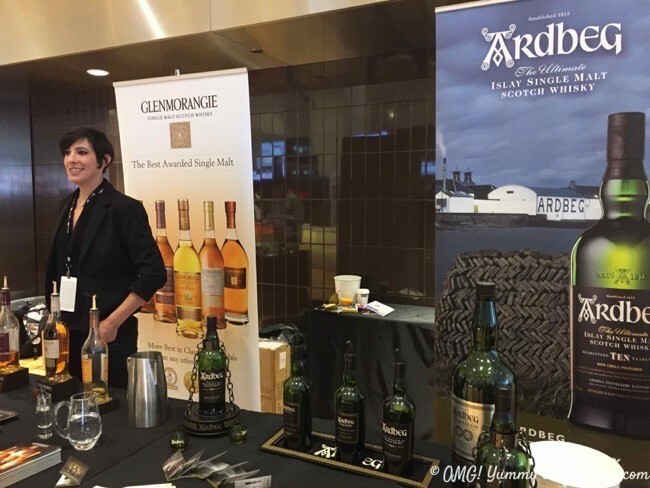 My favorite sip was this peaty scotch from Ardbeg — Corryvreckan — which their website describes this way: “Torrents of taste well up on the palate; deep, peppery and chewy, bombarding the tongue with its intense tastes and textures.” Yes. 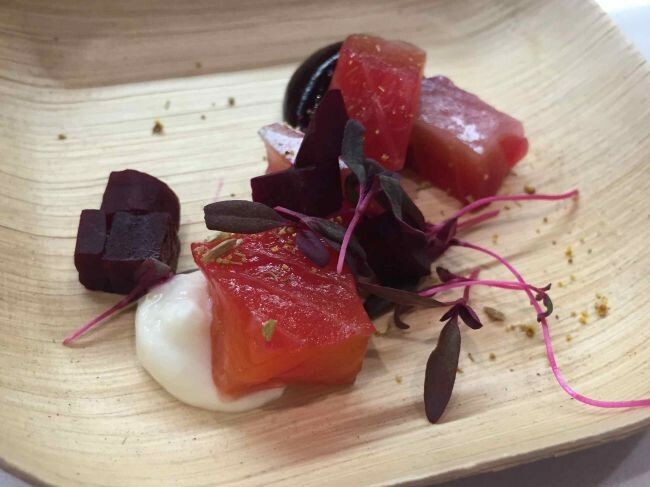 Remember the smoked goat cheese – Lure and Till from Palo Alto tempted us with citrus cured arctic char and smoked yogurt! 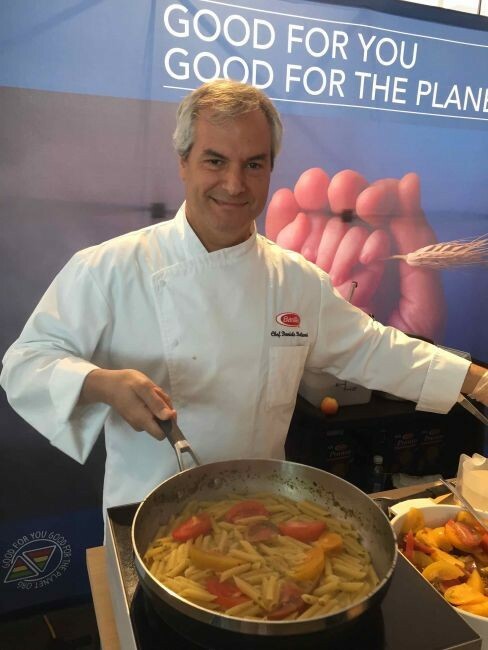 Barilla was a sponsor of the event and demo’d a new concept pasta, Pasta Pronto, that you can cook right in the pan, rather than requiring a separate pot to boil the pasta – they achieve this by adjusting the thickness of the pasta. I tried it at home with their thin spaghetti and didn’t quite get the moisture level correct but the rigatoni at the show was spot on. Perhaps practice makes perfect. 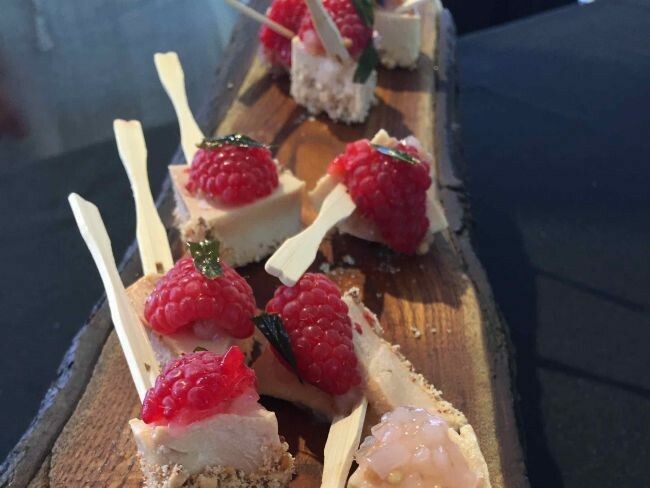 The lifting of the foie gras ban was evident in multiple bites at the event including this poached foie gras with pickled ramps and raspberries by the two-michelin starred Dominique Crenn of Atelier Crenn in San Francisco. Her restaurant offers poetic culinaria – the menu is but a poem that hints at the food to be served. Dormant Chef and I took a break from the food and headed upstairs for a wine seminar presumably about winegrowing in an era of digital and drought. 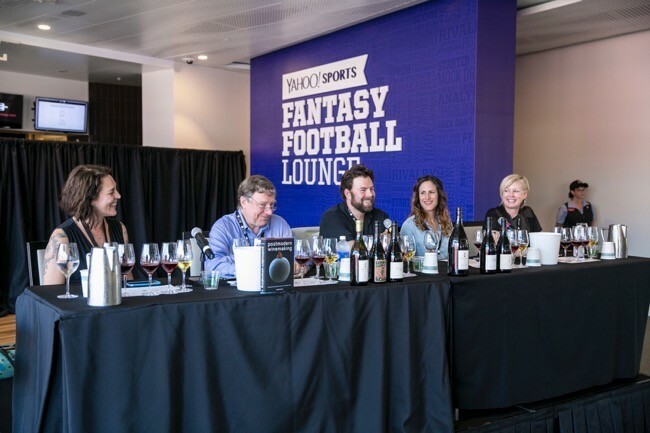 While I was glad to hear the sometimes heated debate among the panel, I found the content more focussed on the concept of manipulated winemaking versus all natural winemaking, not winegrowing in the age of drought and digital. Having spoken on several panels over the last few years, each with excellent moderators, I am always looking for on-point content when I attend a session. 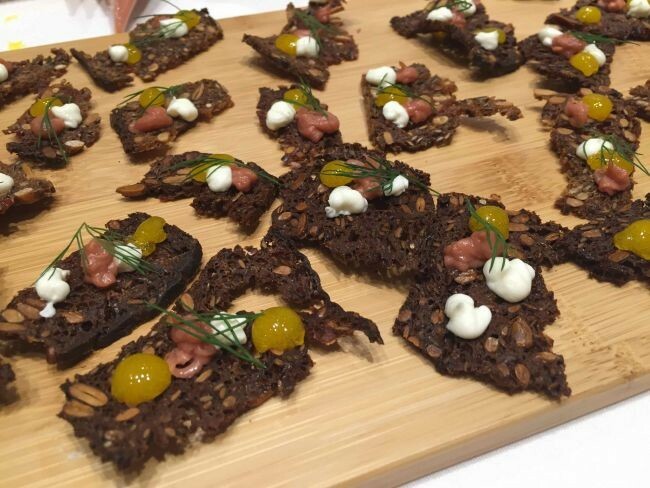 The new sous vide machine (a restaurant water bath cooking technique now available for home cooks in small form factor) from Nomiku offered this interesting bite of rye toast topped with sous vide prepared egg, bacon strawberry jam, and chevre. Nomiku’s new internet connected model is a clear example of where technology and food are intersecting. My last highlight was a stop at The Slanted Door tasting booth. Chef Charles Phan was there himself and graciously conversed with Dormant Chef about food in his native VietNam. His coconut rice pudding with mango gelee and shiso was a perfect sweet ending to a decadent day of tastes and sips. 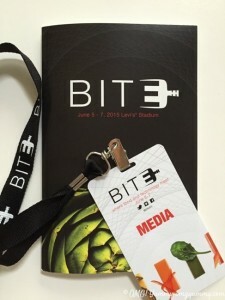 I’m already looking forward to BITE Silicon Valley returning next year with even harder hitting conference sessions, more small group discussion opportunities for idea exchange, and another weekend of bites showcasing the broad and deep cuisine and drink creations of the culturally diverse Bay Area. Such an informative post Beth! I hadn’t even heard about Taste of Bite Silicon Valley! What a compelling way to spend two days. There is so much to learn and discuss with it comes to food. 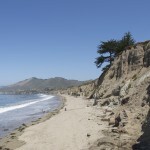 Hi Deb – maybe I can convince you to drive up and join me next year??!! !